Caraselle Direct – Home Accessories Products Knitwear Hangers and why you need them! Prevent ‘notched shoulders’ with Knitwear Hangers! 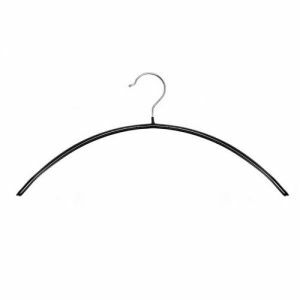 Not all hangers are the same – with so many different types of clothing why would you use the same hanger to hang them up? Even in Summer having a knitted top to hand is essential and keeping them in your wadrobe makes them easy to find. However knitwear needs special treatment to avoid the ‘notched shoulders’ many of us have had at times in our knitwear! Well no more shapeless, falling on floor, notched shoulder, scrunched up in a pile at the bottom of the wardrobe knitwear for you! Because with proper knitwear hangers you can avoid those awful ‘notched shoulder’ marks you get when sometimes hanging up knitwear and you can also avoid your jumpers and cardies falling off all the time! They’re also really useful for drying your knitwear too. If you like these you’ll also like the Best Selling Huggable Hangers – called huggable because the clothes really do hug to them making them ideal knitwear hangers! If you’re short of space they’re the ultimate space saving solution to your wardrobe. With a rotating swivel chrome hook for hanging clothes over wardrobe doors ready to take the next day and also great for drying clothes. Drying knitwear is notoriously tricky to dry without getting out of shape, but products such as these Inflatable Hangers provide a multi-purpose solution! These Grey Flock Finish Non-Slip Inflatable Hangers again have a rotating hook and the flocked finish provides a non-slip surface for hanging knitwear. Not only that, these versatile hangers are ideal for Travel as they take up very little space in your suitcase.